KillSwitch lets you quickly troubleshoot and repair very important Windows settings and features which are other wise hard to reach. This feature greatly benefits users at beginner level. If crucial Windows settings does not work, they can be fixed only experienced and skilled geeks. But with KillSwitch even inexperienced users can troubleshoot and fix those problems with a few clicks. 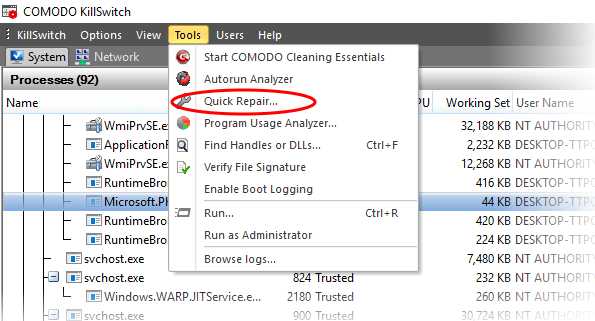 Alternatively, click the Quick Repair icon from the Tool bar. 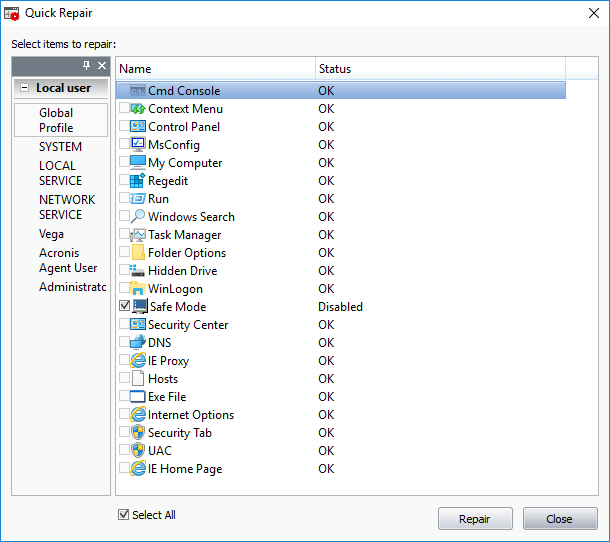 The 'Quick Repair' dialog lists set of features that can be repaired and their current status. You can change the profile from the left hand side pane so as to switch the display of the statuses of features are as per the selected administrator's/user's profile. Select the checkboxes beside the items you wish to troubleshoot and repair. Note: The checkboxes will be active only for the items that require fixing. If you want to select all the items that need fixing, check 'Select All'. Click 'Repair'. KillSwitch will automatically fix the errors in the settings of the selected item. A completion dialog will appear.